Extracellular matrix (ECM) synthesis and degradation plays and important role in the initiation, progression and complication of atherosclerosis and in-stent restenosis but also in aneurysm formation/degradation and graft disease. Enhanced synthesis of ECM typically leads to expansive or constrictive vessel wall remodeling resulting in plaque stability but also arterial stenosis or in-stent restenosis. In contrast, advanced ECM degradation can lead to plaque instability and subsequent plaque rupture as typically observed in patients with acute coronary syndromes. In an animal study of left carotid artery injury, enhanced collagen and elastin formation was found three weeks post balloon angioplasty compared to the non-injured control vessel. In this study we sought to demonstrate the feasibility of non-invasive MR imaging of vascular remodeling in a swine model of coronary injury using a novel elastin-binding low molecular weight contrast agent, BMS753951 (abstract 12957, AHA 2007: Bristol Myers Squibb, Billerica, MA). Vascular injury was induced in 6 female landrace pigs (30–35 kg) by endothelial denudation (LCX) and stent placement (LAD) or vice versa, followed by a 28 day normal diet. The RCA served as control vessel. Lasered MR-lucent prototype stents (Aachen Resonance, Aachen, Germany) were used to allow artifact free imaging of the stent lumen and vessel wall. At day 28, free-breathing coronary MRA and delayed enhancement imaging of the coronary vessel walls was performed using a 1.5 T MR scanner (Achieva, Philips Medical Systems, NL) pre and after injection of 0.2 mmol/kg Gd-DTPA. Imaging parameters of the free-breathing ECG triggered and navigator (NAV) gated inversion recovery (IR) segmented gradient echo vessel wall sequence included FOV = 320 mm, matrix = 256 × 256, in-plane resolution = 1.25 × 1.25 mm, slice thickness = 3 mm, acquisition window = 50 ms, TR/TE = 4.7 ms/1.4 ms, flip angle = 30°, inversion time = 285 ms (@ 90 bpm), and slices = 24. Two days later, coronary MRA and delayed enhancement coronary vessel wall imaging were repeated pre and post injection of 0.1 mmol/kg BMS753951 until two hours post injection. After completion of MR imaging, x-ray coronary angiography was performed to assess the degree of luminal stenosis in the stented and balloon injured vessel segment. 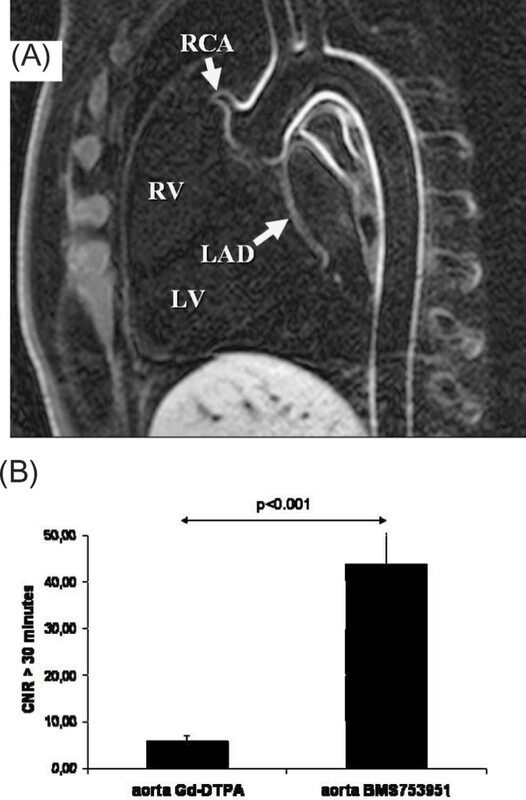 Subsequently, animals were euthanized and gadolinium concentration was determined by inductively coupled plasma mass spectrometry (ICP-MS) in the ascending aorta. For objective image analysis, contrast-to-noise ratio (CNR) between vessel wall and blood was determined by manual segmentation of the coronary vessel wall in the stented, balloon injured and control vessels on reformatted images. No visually apparent enhancement of the stented, balloon injured and control coronary vessel segments was observed after administration of Gd-DTPA (Figure 1b, e). In contrast, after administration of BMS753951, strong enhancement of the stented and intermediate enhancement of the balloon injured coronary vessel segment were observed suggestive for vascular remodeling in the injured vessel segments (Figure 1c, f). There was no to little visually apparent enhancement in the control coronary artery (Figure 1c). Quantitative analysis of vessel wall enhancement yielded a 3-fold higher CNR in the stented coronary artery when compared to the balloon injured and control artery (p < 0.001) (Figure 2). 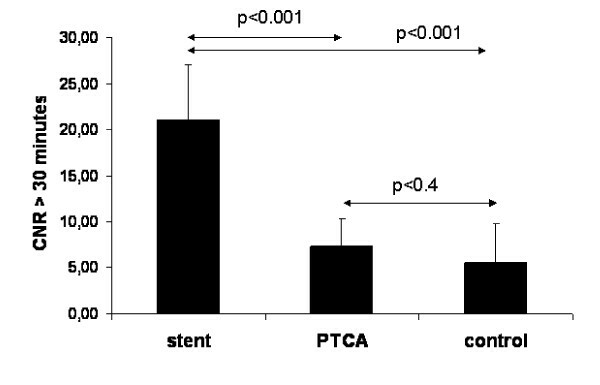 In addition, strong aortic and pulmonary vessel wall enhancement was seen after BMS753951 administration, which is in agreement with the high elastin content in those vessels, while no apparent enhancement was observed after Gd-DTPA injection (p < 0.001) (Figure 3). ICP-MS of aortic samples yielded a gadolinium concentration of 0.29–0.52 mmol/L. Contrast-to-noise ratio (CNR) in stented, balloon injured, and control vessel after administration of BMS753951. We sought to demonstrate the feasibility of imaging vascular remodeling in a porcine model of coronary injury using BMS753951, a novel elastin-binding low molecular weight contrast agent. (A) Vessel wall enhancement in the descending aorta and aortic arch approximately 50 minutes post BMS753951 injection. 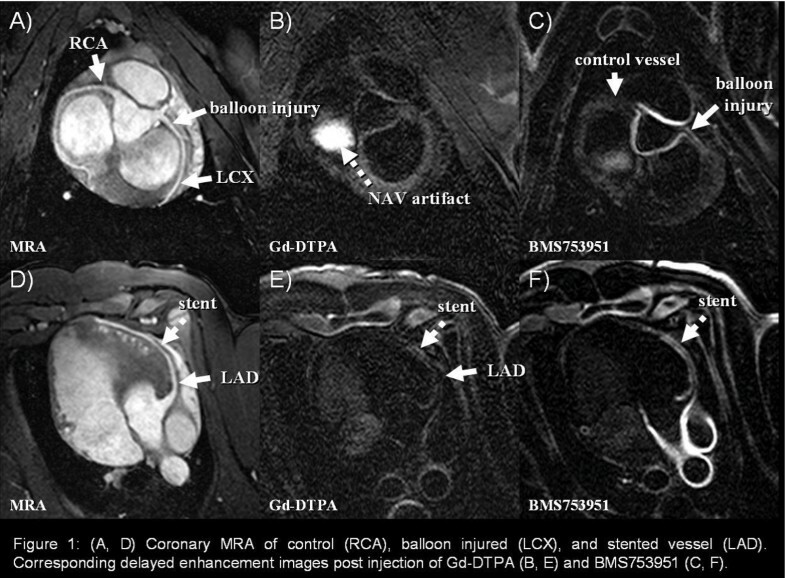 (B) No apparent enhancement was observed after Gd-DTPA injection. This is the first MRI study to demonstrate the detection of ECM synthesis non-invasively in an animal model of coronary vessel wall injury using an elastin-specific contrast agent. This novel approach may be useful for in-vivo monitoring of vascular remodeling post stent placement or for the assessment of plaque burden in patients with suspected coronary artery disease.